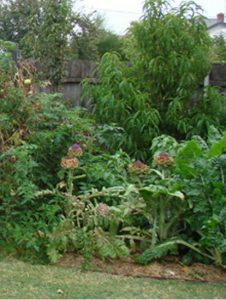 Solutions for greywater, pumps and gardens. 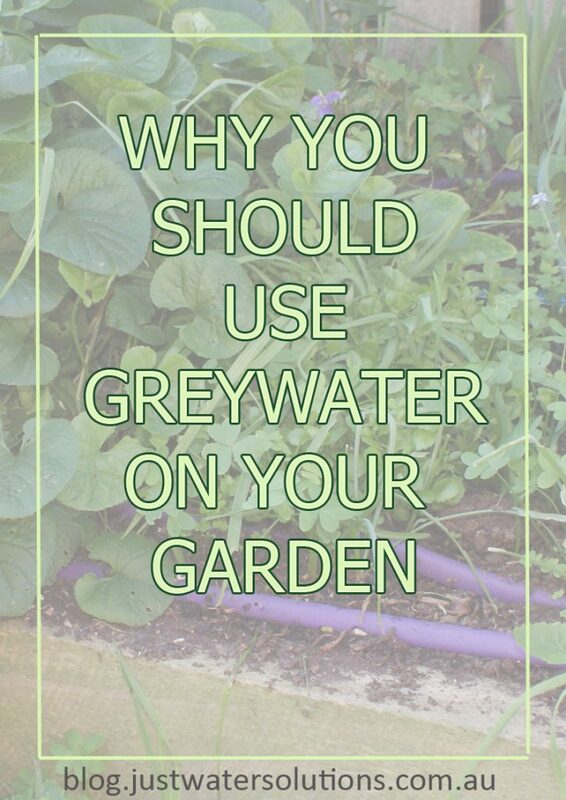 I can't think of a better way to demonstrate the benefits of using greywater on your garden, than the photos below. The garden in our photos is now watered by one of our greywater units, diverting the greywater from the laundry and bathrooms. The Gator Pro pumps the water directly into the dripper line, so the garden is automatically watered whenever water is used in the laundry, shower and bath. 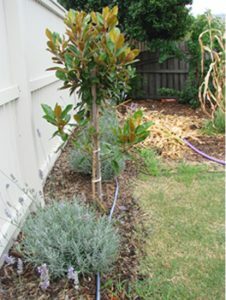 The greywater unit and the irrigation system were installed before a dry summer in southern Victoria. We are using this home to illustrate how fantastic it is to be able to re-use your greywater in your garden to create a magnificent garden while reducing your water bills. The drippers are 300 mm apart, and the photo above on the right illustrates the watering achieved with this spacing. 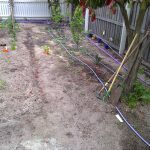 The drip line is laid on dry ground, and the darker soil shows that the drip line gives complete coverage. These garden beds will now be filled with mulch, which will limit evaporation. The mulch also helps to inhibit weed growth, and cover over the dripper lines. 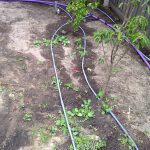 You can see how easy it is to install the drip irrigation, and watch your garden beds flourish when you water them with greywater. The three photos below are of same garden, now at the end of summer. 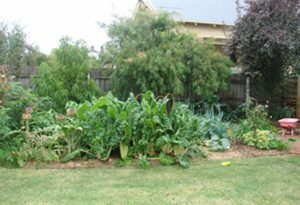 The garden is looking fantastic, and the owners are reaping the benefits of using greywater. If you look closely, you can see the same trees, and the amazing growth they have had in only three or four months! 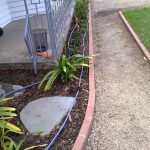 As well as the benefiting from the use of greywater, the garden has thrived because the irrigation system is installed using the correct spacing. This ensures the plants are watered efficiently and run-off and evaporation are eliminated. If you have any questions about using greywater or installing irrigation, leave a comment or send us an message. We're always happy to talk about it!